Less than a week into the General Assembly and seven bills have already been signed into law in Kentucky. 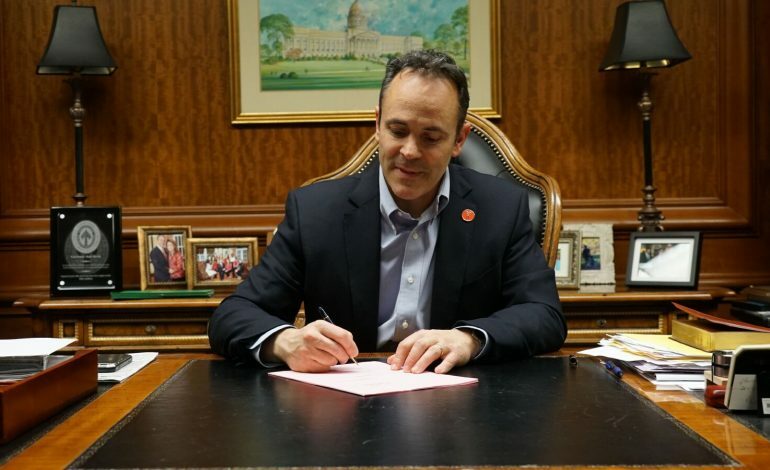 Governor Matt Bevin spent his morning signing bills into law that include transformative measures protecting the lives of unborn children, strengthening the University of Louisville’s governing structure and establishing transparency for public servants. Senate Bill 5 bans abortions more than 20 weeks into the pregnancy and House Bill 2 requires an ultrasound before an abortion. House Bill 1 is the Right to Work bill that eliminates public employees the right to strike and prohibits the mandatory membership of labor organizations. Senate Bill 6 is a law that allows for paycheck protection for employees of labor organizations and House Bill 3 repeals the prevailing wage requirements for public works projects. Senate Bill 12 allows a fresh start for the University of Louisville board of trustees, and Senate Bill 3 opens state legislator pensions to public scrutiny for the first time. All of these laws contain emergency clauses and take effect immediately. House Bill 2 was signed by Gov. Bevin Monday, January 9th. This bill requires a signed form before a patient can have an abortion. For more information on House Bill 2, visit Kentucky House Bill 2.